You are going to want to give up! DON’T! It is an athlete’s job to learn to deal with Pain! It was a lovely spanish after of September 11, 2015. Just 3 days before the Ironman event and I was out on a rote recce when I suffered a bike crash – I got 40 stitches inside my mouth and face, chipped 3 teeth, a badly hurt shoulder, nearly broken wrist and my cycle frame was cracked. Brilliant! Ironman looked easier than dealing with this! …..I had no idea how bad I was hurt but I had some idea seeing the faces of people around me. …they seemed terrified..I laid in OT for about 2 hrs, before the surgeon could come and stitch my wounds. I was lucky that my X rays confirmed no broken bones or muscle rupture or tear…so now when everyone was collecting bibs and visiting race expo, it was a time for me to re-think everything. I desperately wanted to go back to India. I called my brother who flew in from Canada to cheer me up for my dream race. He flew next morning to Mallorca and things started changing as soon as he arrived. I had two options, either fly to Ibiza and party with friends and forget about the race and do it some other time or stay back. I chose to stay back and told my brother to help me reach the start line. We started working tirelessly towards healing the wounds, applied everything we could lay our hands on, made endless visits to the chemist and I religiously drank “Haldi (turmeric) Milk” every 3-4 hours. My face was swollen and lips were triple the size. Negative thoughts – The devil that plays up – I get aggressive to stay mentally tough! When I was done with 90kms of cycling, the heat and the wind had already over taken my mind and body. I started to self talk… could feel the devil inside me take over my brain because now the blood and oxygen supply to the brain had substantially reduced and you are out of that racer “high”‘. This is where you forget all your training and leanings….I cursed myself for registering for this event….for not going back to India after the accident…for being so stubborn… thought comes in the Mind, is really is this what I have paid up for. The devil inside feeds on your negative thoughts and the moment you get carried away, you have lost it. Training for an endurance for the level of Ironman is about spending a lot of time with yourself and learning to deal with PAIN…knowing your weaknesses and strengths….and then it becomes a bit like meditation….where ironically after a lot of conflict of pain and fight within the mind, the mind becomes much stronger and mysteriously calmer. That’s when the mind learns to demotivate the devil inside which is ready to pull you down.. There were challenges because I could not eat anything during the race because of stitches in my mouth and I was only hydrating myself. But when it was announced “Gaurav Makkar from India, you are an Ironman” . I realised that the pain, the hunger, the sweat and the soul-breaking accident have all trained my body to do incredible things! 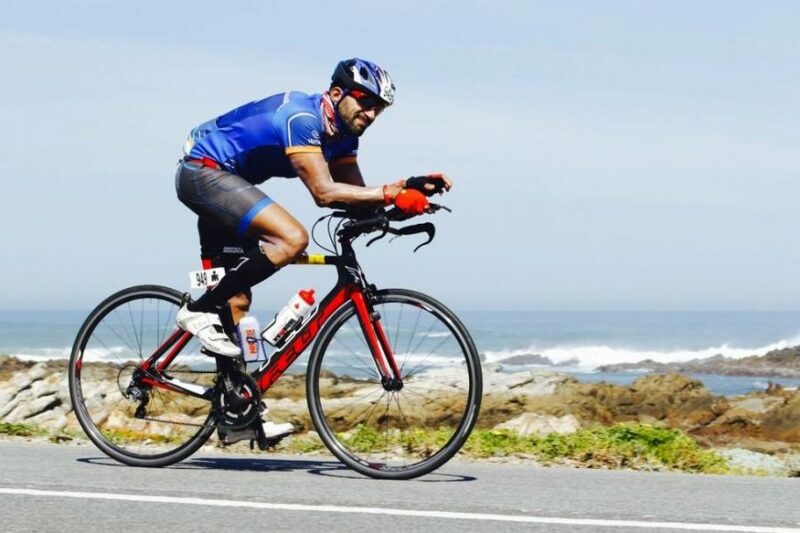 Gaurav Makkar is an endurance athlete. He isn’t a born athlete or a sportsman, but someone who has molded his life around fitness in the last couple of years. He strongly believes that it’s never too late to start and try new challenges in life. He has participated in Ironman, Spain and South Africa and is a podium finisher in a Half Iron Triathlon. He holds a podium finish in the Desert 500 event and has completed a 5km Swimmathon in the Indian Ocean!! The hunger for doing many more Ironman events in different parts of the world stays with Gaurav. For him, mind over matter is everything. Gaurav and I wrote this article together…While he gave the piece his voice and his thoughts, I made an effort to put them down for him. With an accident 3 days before an event for which one trains for months, it was truly his mental strength that took him to the finish line. Wow Gaurav. Proud of u.
Gaurav. You are the REAL Ironman! Incredible, that reminds em of Lance armstorng. Wow wow wow .. A gud doze for me . Hats off to this courageous soul. Tons of wishes for the achievement, and infinite claps for your determination Gaurav. And thanks to Tanya too, for ensuring that this part was written and spread across. Coz you know not what wonders it is going to do among us.